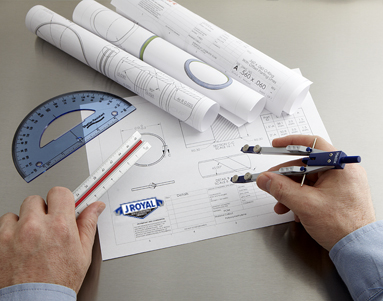 Product design is crucial and J Royal will support you with unparalleled design assistance. With our vast and diverse customer base, we’re experienced with virtually every category and application. This includes, but is not limited to, spraying equipment, water filtration, small engines, plumbing, lawn and garden, camping equipment and automotive. With such a wealth of experience and innovation, our engineering staff employs best practice engineering solutions developed across multiple industries. Any design project begins with a complete review of all drawings and models. Nearly all design assistance requests are solved with a brief review and the applied basic seal design parameters. If your project has more complex challenges, J Royal can recommend material and design modifications that can solve any technical issue. The changes we recommend might be for the configuration of the mating components or for the seal itself. If you wish to begin the design assistance process, call J Royal at 800-626-8807 or email our engineers through our “Ask an Engineer” tool.